Massachusetts state treasurer Shannon O'Brien easily beat a former U.S. Labor Secretary and two state politicians in the Democratic primary for governor and will challenge former Olympics chief Mitt Romney in November. O'Brien, the party's front-runner for months, is trying to win back the governor's office for the Democrats after a dozen years in Republican hands. If she wins, she would be the first woman elected governor in Massachusetts history. With 96 percent of precincts reporting early Wednesday, O'Brien had 234,262 votes, or 33 percent. Former Labor Secretary Robert Reich was next with 178,006 votes, or 25 percent. State Senate President Tom Birmingham and former state Sen. Warren Tolman had 24 and 18 percent, respectively. In Oklahoma, meanwhile, state Sen. Brad Henry scored a surprising come-from-behind victory over restaurateur Vince Orza in the Democratic gubernatorial runoff. Orza had finished first by 16 percentage points in the Aug. 27 primary and was favored in the runoff. On Tuesday, Henry led with 135,315 votes, or 52 percent, to Orza's 122,882, or 48 percent. "The pundits said we couldn't do it. But I'm here to say we won," Henry said. Henry, 38, advances to the November election against Steve Largent, a former congressman and professional football star. GOP Gov. Frank Keating is barred by state law from seeking a third term. Also in Oklahoma, former Gov. David Walters defeated lawyer Tim Boettcher for the Democratic Senate nomination. He will face GOP Sen. Jim Inhofe in November. Walters had 146,872 votes, or 57 percent, to 111,067, or 43 percent, for Boettcher. In Massachusetts, Republicans have held the governor's office since former Gov. Michael Dukakis didn't seek re-election in 1990. The Democrats hold every other statewide office, all Congressional seats and majorities in the House and Senate. O'Brien was boosted by key endorsements and money from women's groups. Romney, the former Salt Lake City Olympics chief and son of former Michigan Gov. George Romney, faced no primary opponent. O'Brien is also trying to become the first woman elected Massachusetts governor. GOP acting Gov. Jane Swift moved up to the post when Paul Cellucci was named ambassador to Canada. Swift, who was plagued by personal and political controversies, dropped out of the race hours before Romney announced his candidacy. Even before the primary, O'Brien and Romney were swapping charges. 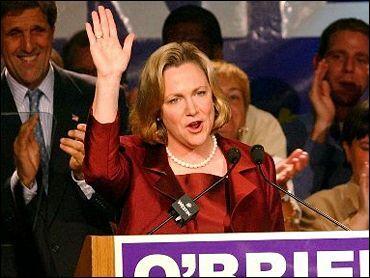 O'Brien, who is married to a former Enron Corp. lobbyist, complained that Romney's supporters went too far by showing her photo next to disgraced Enron and WorldCom Inc. executives. She called Romney a bully — a sensitive issue, since some accused him of "elbowing" Swift aside. The Romney campaign responded by calling O'Brien a bully for challenging Romney's state residency and trying to keep him off the ballot. "Mitt, you should know Massachusetts voters are smarter than that," O'Brien said at her victory party. "You didn't fool the voters today, and you're not going to fool them in November." Romney's choice for lieutenant governor, Kerry Healey, a female former state party official, defeated party activist James Rappaport for the GOP nod. Healey's nomination was seen as key for Romney's hopes, since some observers said a ticket of two wealthy, white businessmen would have been unelectable. Christopher F. Gabrieli, a venture capitalist and public policy advocate, won the lieutenant governor nod on the Democratic side. In Oregon, voters passed a pair of measures to help balance the budget. One raises the cigarette tax by 60 cents a pack to fund a state health plan for the poor, and the other gives schools $150 million from a lottery-fed education fund. In Washington, only one of the state's nine House seats generated a real primary fight: Norma Smith, a one-time aide to former Rep. Jack Metcalf, held a slight lead over former CIA official Herb Meyer for the GOP nomination, but the race was too close to call. The winner will take on freshman Democratic Rep. Rick Larsen and Libertarian Bruce Guthrie.